Facing a serious budget shortfall, the 2nd Alaska Legislature moved quickly to enact several tax measures to generate additional revenue. Lawmakers established a motor vehicle license tax and increased personal income tax rates as well as those on cigarettes, liquor, wine, and motor fuel. In an effort to encourage economic development, the Legislature created the Alaska State Development Corporation, the Alaska State Mortgage Association to provide secondary mortgage facilities, the Mineral Resource Revolving Board and Fund, and the Tourism Advisory Board. In 1961, the Legislature also authorized the sale of bonds for airport construction and the ferry system, and appropriated $1 million for new road construction. Lawmakers also focused on local government and the formation of boroughs as directed by the State Constitution. After two years of hearings and study, the Legislature passed the Borough Act of 1961, as well as legislation that revised methods of incorporation for first, second, and fourth class cities. The Borough Act permitted the establishment of borough governments by local option and designated all areas not within the boundaries of an organized borough as the unorganized borough. The Act, however, met with resistance at the local level and highlighted the "tax equity" problem; that is, urban residents, unlike rural residents, paid local property taxes to support local services. These issues would continue to be a force for legislation well into the future. In 1962, lawmakers changed the school funding formula from a relatively simple method that financed a certain percentage of each district's budget to a more sophisticated calculation that was based on the number of students in each district. During the 1960s the state collects an average of 36.5 percent of its total revenues from personal income taxes. 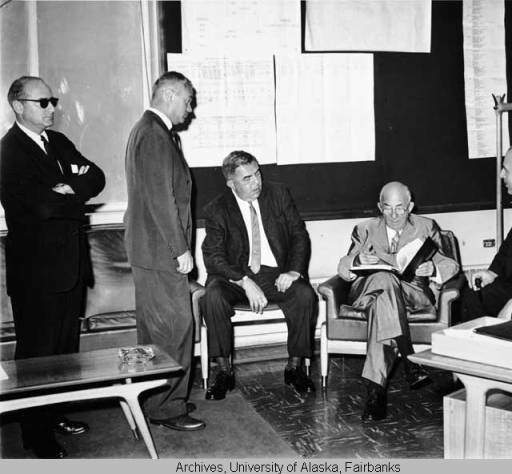 Public broadcasting begins in 1962 when KUAC, an FM station licensed to the University of Alaska Fairbanks begins broadcasting. Alaska voters reject the second initiative to move the capital from Juneau to the Anchorage area. Alaska Natives organize to protest "Project Chariot" - the federal Atomic Energy Commission's plan to create a deep water port in Alaska by using nuclear explosions. In April 1961, the USSR sends the first man into space; May 1961, Alan Shepard is the first American (and second person) in space. Cuban Missile Crisis - the USSR agrees to remove nuclear missiles from Cuba, averting the immediate threat of nuclear war.